What I learned years ago from Michael Price was that weak markets react poorly to “bad” news, while strong market just sluff it off. Early this week we saw the market take a big tumble as news hit that the Republicans may actually jump off the fiscal cliff and take the credit of the U.S. of A. with them. Note in the histogram above the price chart (in red) buying in the previous week, then selling (below the zero line) early this week, with a weak recovery late week. The selling was not a panic type of selling but rather a lack of demand (buying). 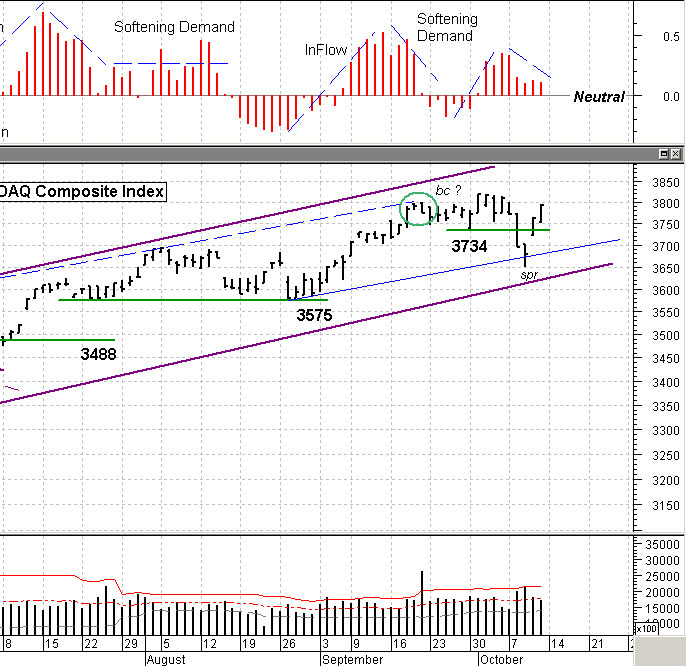 By Wednesday we dropped below my 3734 support line but held just above the reverse trend line (light blue line). After the late week rally we’re back about mid-channel (solid purple lines. Right now demand is soft and there is a lot of waiting to see what happens in Washington. As far as indicators go, I see trend changes firing but the lack of “Initial Selling” has caused me to believe that this (for the time being) will be a contained correction. We may have seen the bottom but that depends on the news next week. The pie chart of the S&P 1500 stocks confirm a mixed bag here. 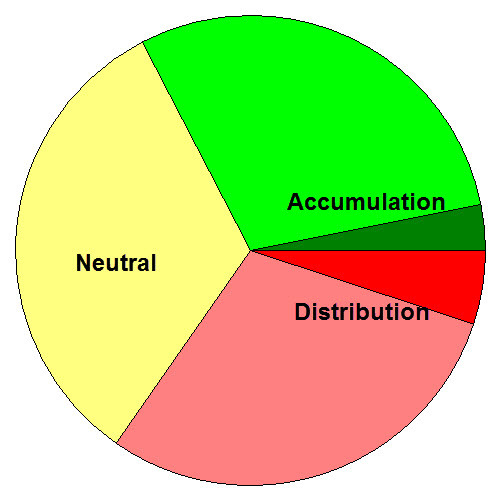 About as many stocks are green (under accumulation) as there are red (under distribution); the remaining are yellow / neutral. And so this goes. A weak market due to lack of demand that is driven by the news (a.k.a. fear). The low on Wednesday will be one to watch unless we see major selling coming into this market, then we exit gracefully no matter what. Next week will be important, so be extra careful and vigilant. I am “dancing close to the exits” now and as stops are hit on individual stocks I’m staying in Cash. No “exit selling”, but no “entry buying” either. Have a good week. ……………. Tom ……………….